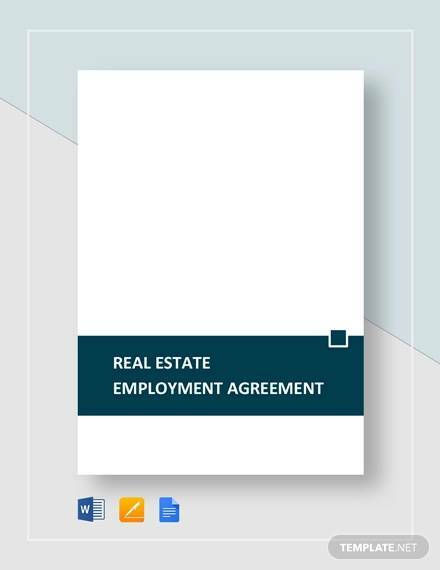 An employment agreement is a legally binding written document that is signed by both the employer and the employee. 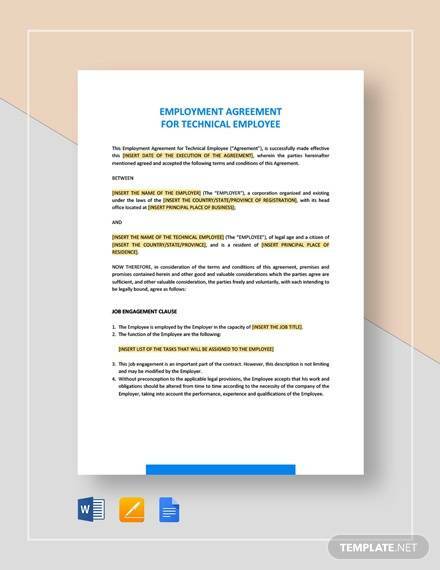 Employee agreements are essential when hiring an employee because it allows employers to lay out the ground rules to new employees and to set proper expectations. 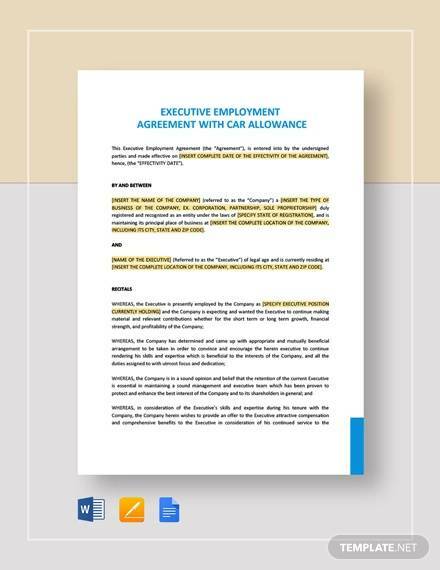 What Are the Advantages of Having an Employment Agreement? 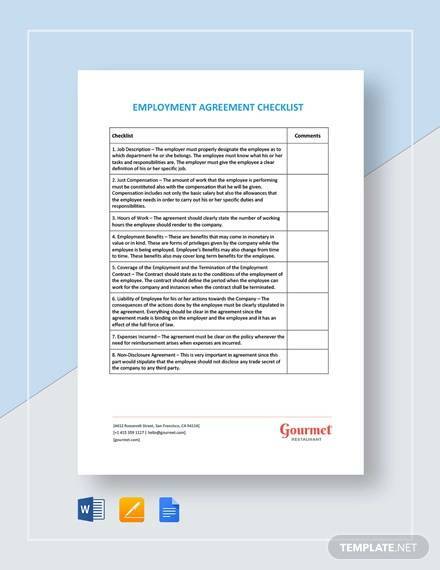 Employment agreements can be very useful for employers who want to maintain employee loyalty and who want to ensure that employees do not just go on AWOL. This is especially true among companies who have paid a lot to recruit or train an employee and does not want to go through additional costs and added time in looking for a replacement. 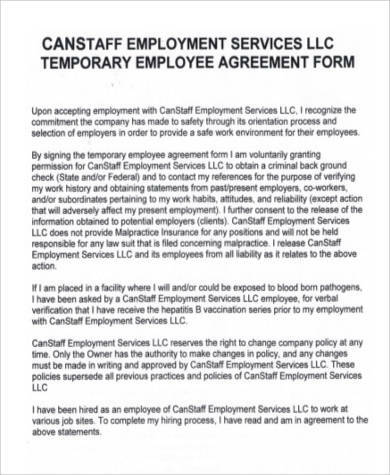 One of the perks of an employee contract is that it helps lock down an employee for a specific time frame or requires an employee to give due notice, usually about thirty or ninety days, in order for employers to find a replacement and to train him. 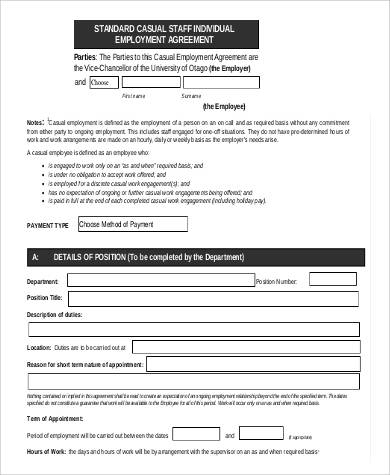 Other employment contracts impose fines on employees who resign even before the agreed time frame, and, although you cannot force employees to stick it out with you, imposing penalties can make them think twice about leaving your employ earlier than expected or sitting it out a bit. 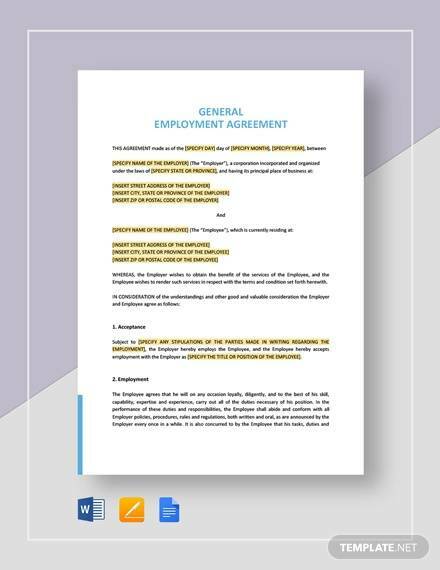 An employment contract also plays a vital role in maintaining confidentiality within the workplace or in the business. 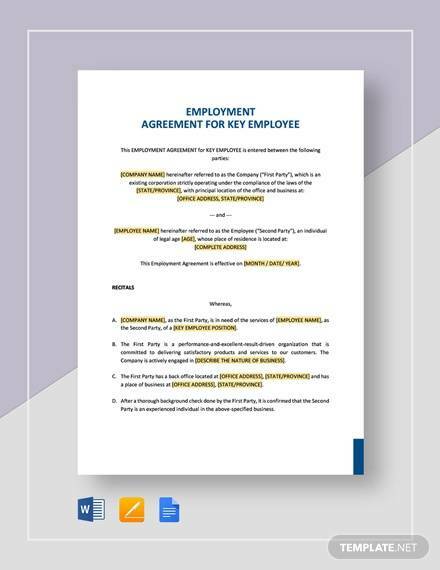 Most employment contracts contain confidentiality clauses and non-compete clauses to secure private and sensitive information such as trade secrets. 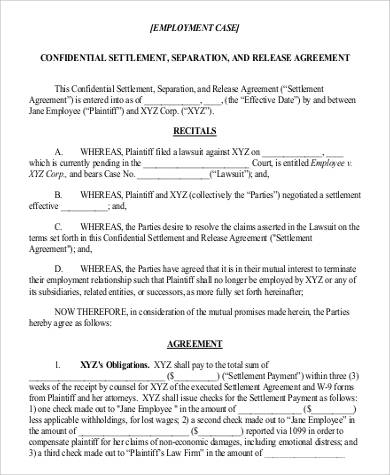 Confidentiality clauses are clauses that prevent or prohibit an employee from leaking or disclosing any type of information that is related to work for personal gain while a non-compete clause prevents an employee from competing against you or working for a competitor company after leaving your employ. 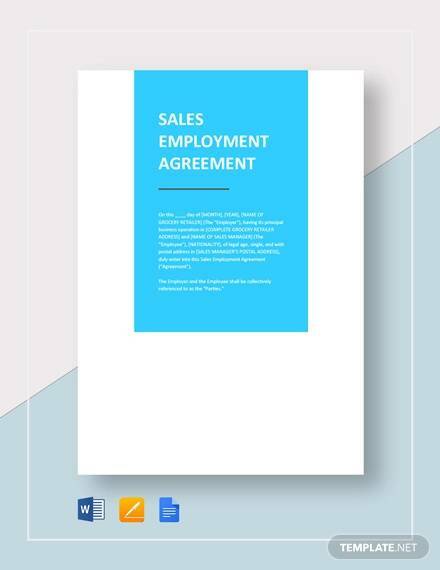 At times, an employment contract is used to sweeten up a deal in order to lure a candidate into working for you instead of working for the competition. 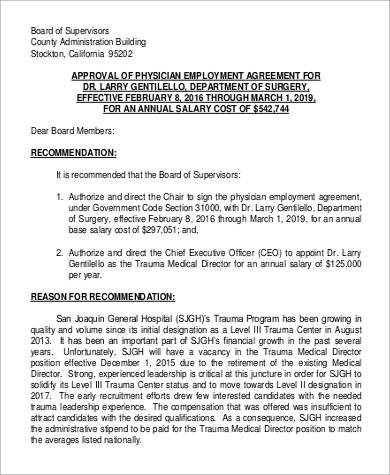 This can be done by offering a more competitive compensation package, job security, and additional benefits or incentives. 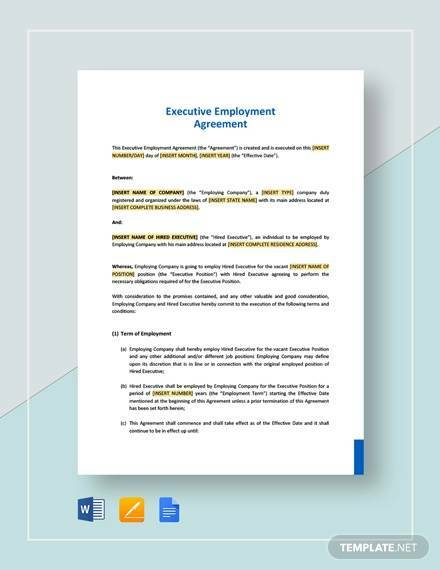 You can also utilize employment contracts to gain control over an employee’s level of performance and productivity in order for you to set a specific type of standard that the employee needs to attain in order to be retained within the company. 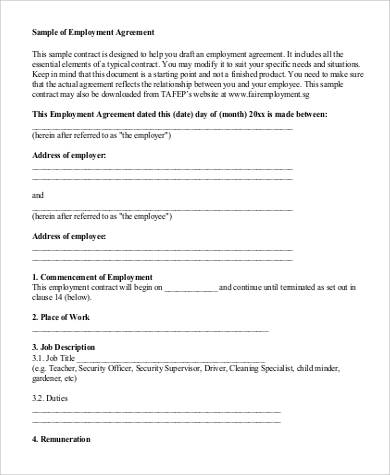 Employment agreements or employment contracts typically contain details such as the employee’s name, the employee’s starting date, the amount of salary, schedule and work hours, attendance and leaves, and terms pertaining to the protection of the company’s assets and confidential information. 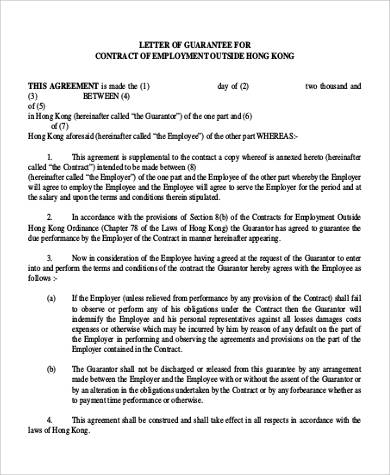 An employee contract is a legal contract that obligates an employee and an employer. 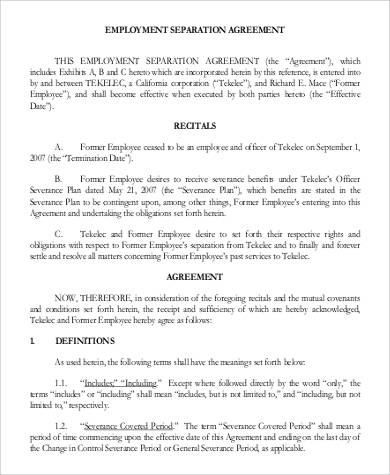 An employee contract typically states particular subtle elements such as the terms and conditions that commits both the business and the worker to take after. 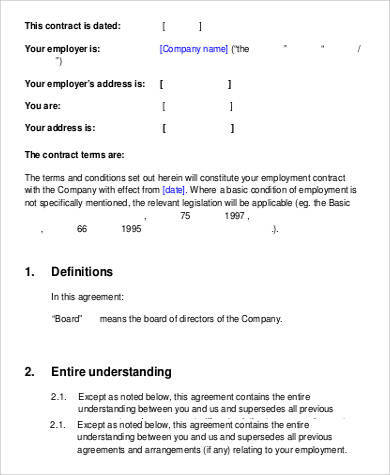 As soon as an employee is hired, an employee contract should then be constructed to bind the employee to the company. 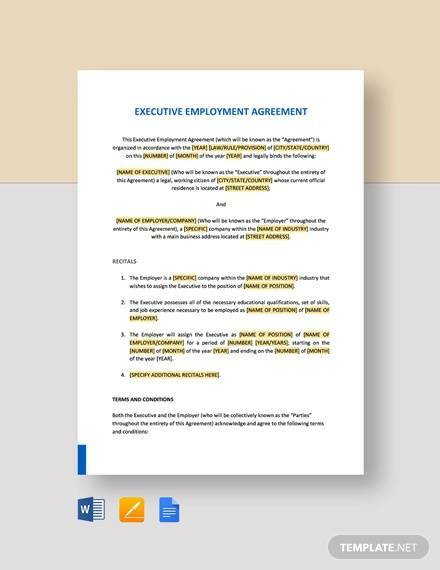 An employee agreement contract typically commences with the names of both the business and the organization or the association he will be connected with. 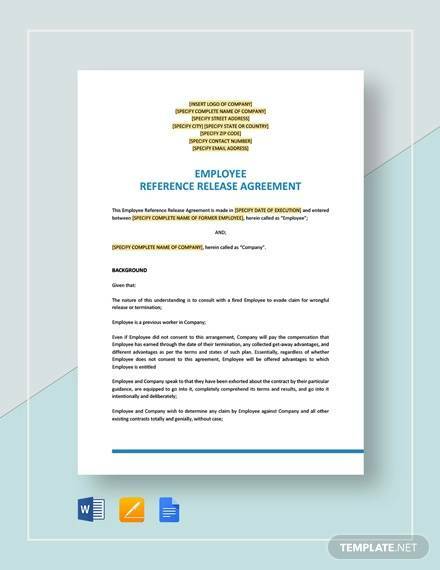 Including the employee’s date of hire will help recruiters, employers, and even employees themselves to trace back on the exact date that they started. 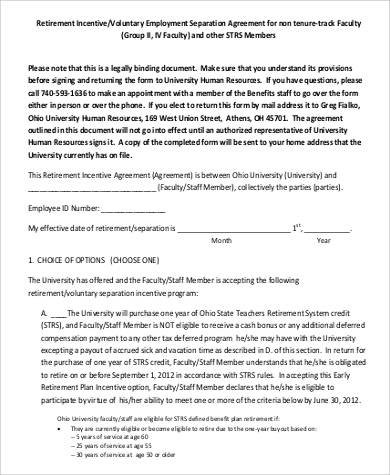 The start date of the employee is considered to be the date when the contract takes effect. 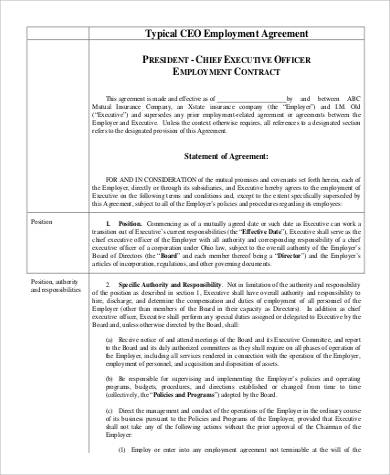 The employee’s work position and his job responsibilities should be clearly defined within the contract. 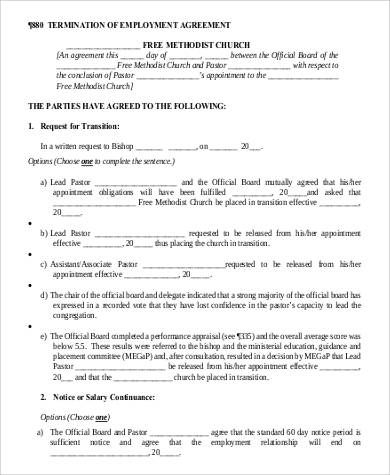 This helps to set proper expectations as to what is expected of him and to help prepare him for his obligations. Employees should be given a heads-up as to the number of hours they are expected to work in a day, in a week, or in a month. Most employers require a full-time employee to work at least 9 hours a day, 45 hours a week, and 180 hours a month while others offer a more flexible work schedule just as long as the employee is able to provide outputs and finish their work on time or before the deadline. 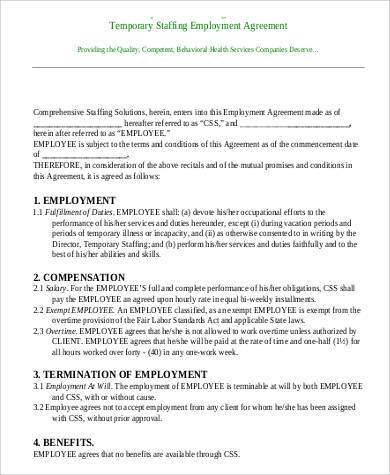 Most employees usually check on the compensation package that is being offered by the employer before checking out the rest of the contract. 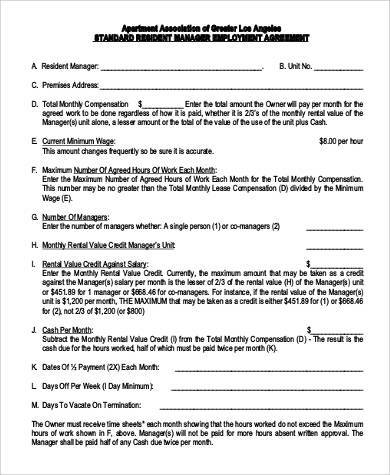 An employee’s monthly income is usually the clincher that makes an employee firmly decide on whether he should sign the contract or not. 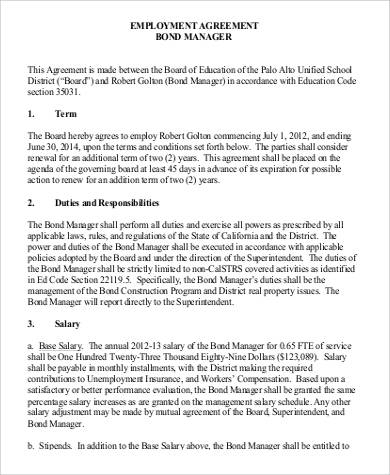 In addition, anything that involves salary deductions, incentives, cut-off schedules, and the date of the month when pay will be given should also be indicated in the contract. 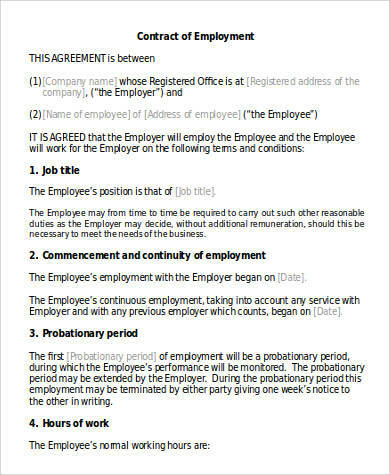 Some companies have probationary periods prior to regularizing an employee. 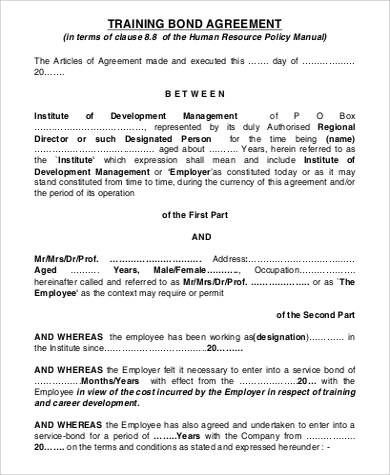 If such is the case in your company, then the terms leading up to an employee’s regularization have to be properly stated in the contract such as the duration of the probationary status and the performance criteria that the employee needs to achieve in order for him to be regularized. 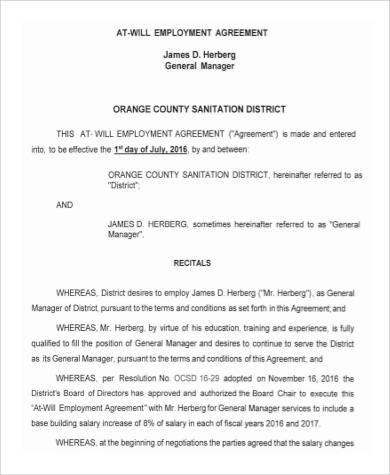 It is also important to disclose certain evaluations being done monthly, quarterly, or annually and the corresponding increase of salaries and incentives for good performance. 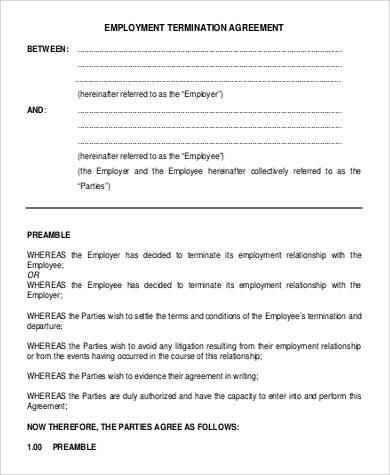 Terms and conditions relating to the termination of an employee have to be clearly defined in the employment contract. 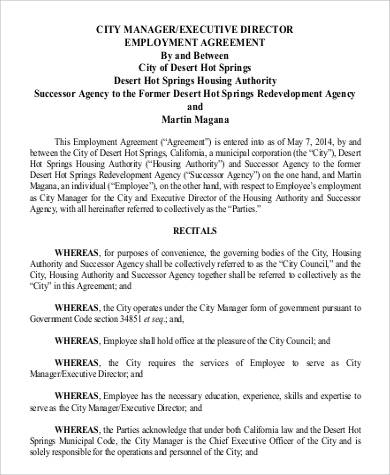 Unlawful termination could be grounds for labor disputes. 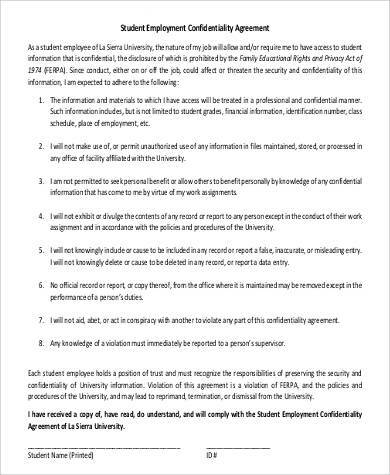 Be sure that you properly set out expectations among your employees when it comes to your required standard of performance. 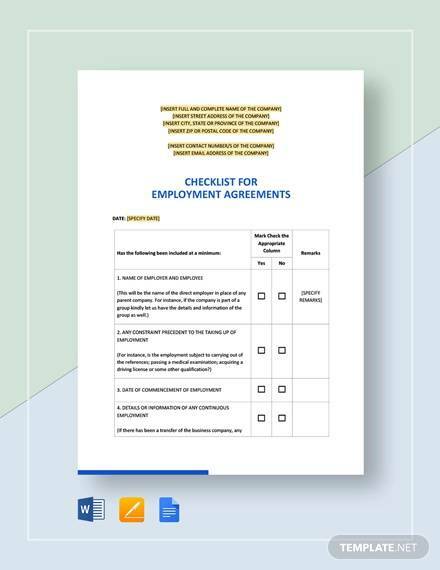 For example, establishing an annual performance evaluation that could help you in determining your employee’s worth to your company and to help you assess if they are worth keeping or not. 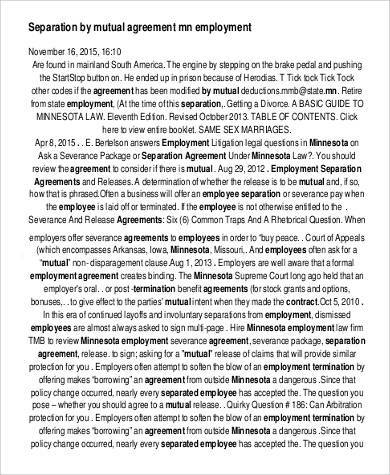 Proper documentation of an evaluation result or action forms can help to support the reasons for terminating an employee. Employees missing out on work can cause an encumbrance among employers. 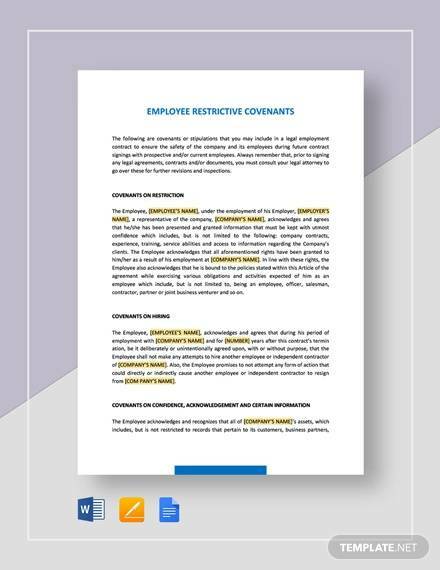 Implementing and establishing rules pertaining to attendance, non-attendance, and tardiness allows an employee to set proper expectations among his employees. 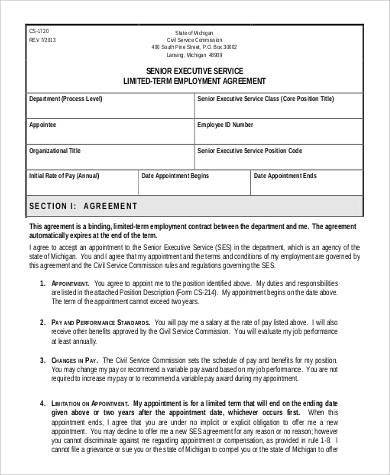 The number of sick leaves and vacation leaves should also be stated in the contract to help guide employees regarding attendance concerns. 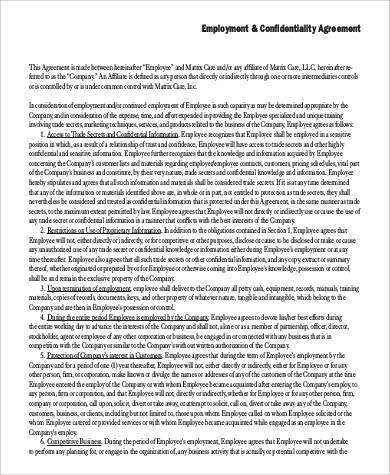 Most employers typically include a nondisclosure and a non-compete clause within an employee contract. 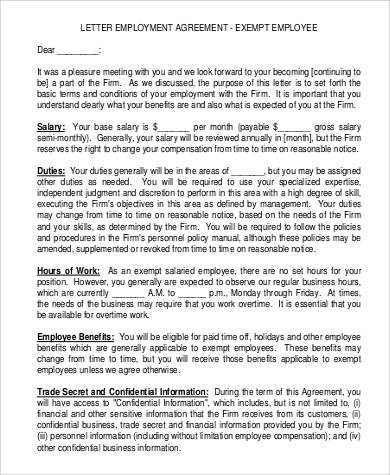 Nondisclosure agreements prevents an employee from leaking or sharing sensitive and confidential information about the company to third parties or in non-work-related situations. 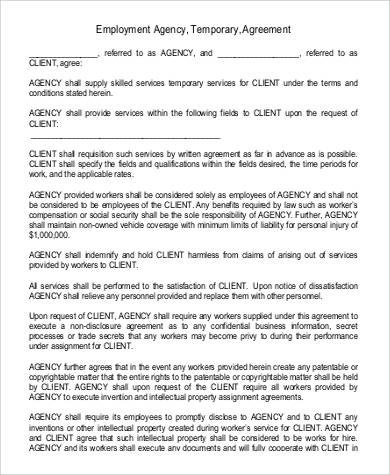 A non-compete clause, on the other hand, prevents an employee from working with a competitor or from competing directly with his previous company within a time frame frame, usually for 1 or 2 years. 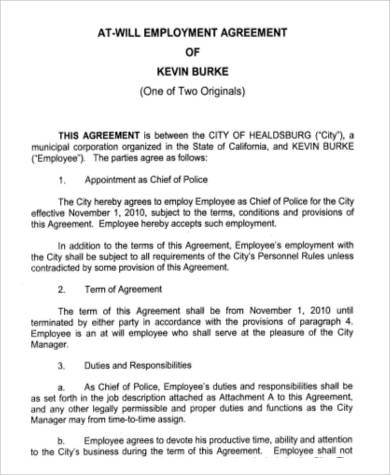 As a matter of principle, an employee contract should always be in writing. 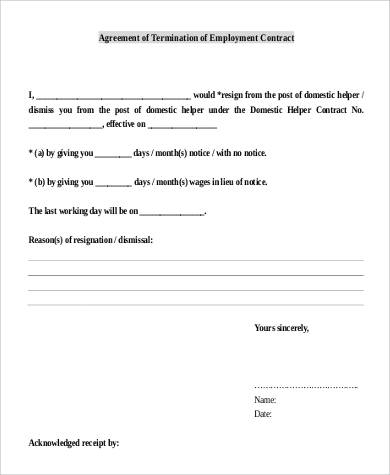 Although oral agreements are not prohibited by law, they are usually deemed invalid and are difficult to prove in cases of doubt or if contested. 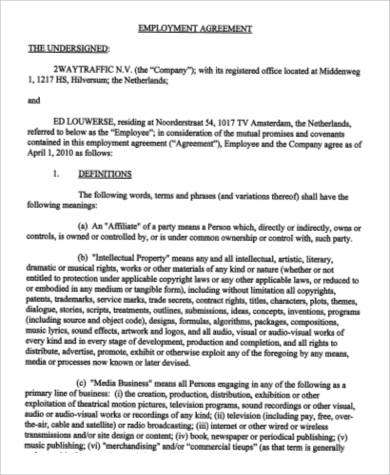 Written contracts provide clarity and serves as a tangible piece of evidence whenever a dispute arises. 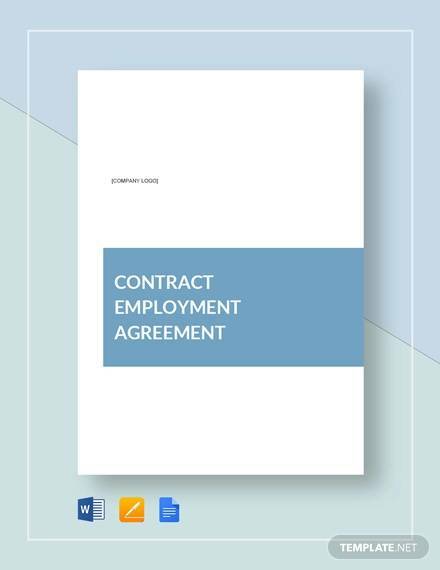 Some employment contracts fail to take into account every little detail related to work terms and conditions and are often referenced collectively. 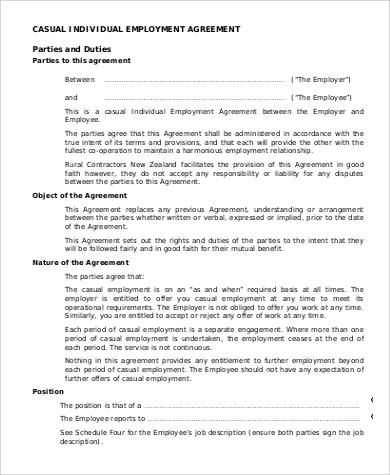 Employees should be given a copy of their employment agreement for their own reference. 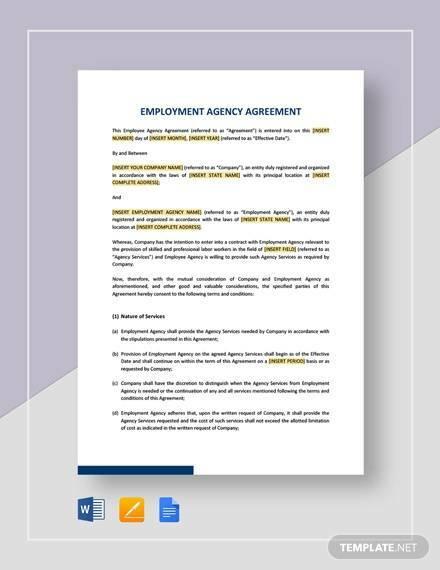 Prior to signing an employment contract, the employer and the employee usually discuss the terms being laid out in the contract, giving employees a chance to ask questions or to request for amendments. 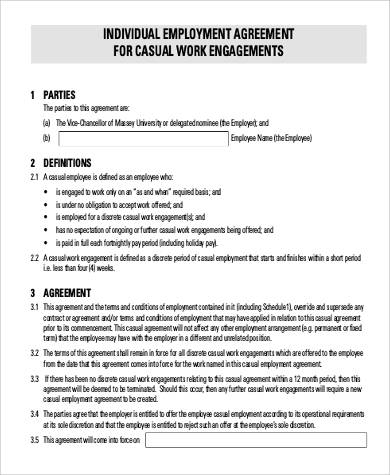 Other employees take a couple of days to think about whether to sign a contract or not; however, when an employee willfully signs a contract, it is then taken as an agreement and an affirmation of acceptance to the agreement. 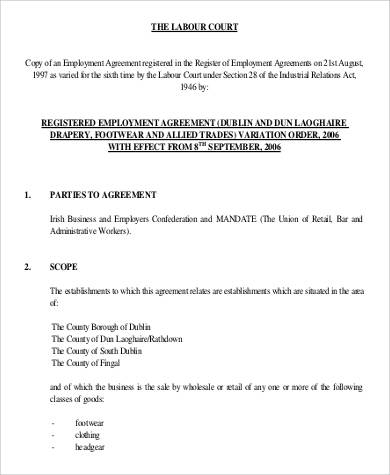 Employment contracts are important documents that should not be taken lightly. 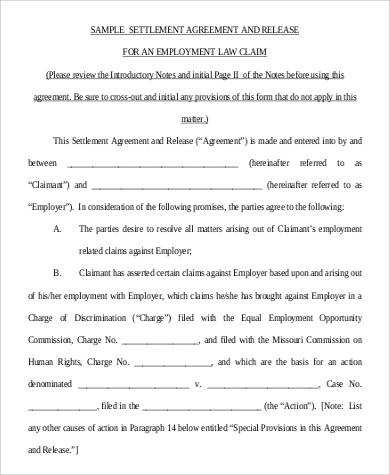 Lots of companies have been affected financially due to lawsuits filed by employees because of loopholes found in employment contracts. 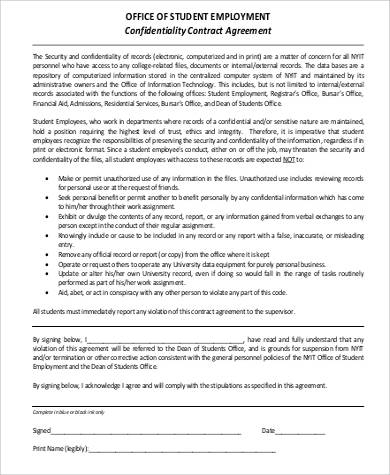 Protect yourself and your company. 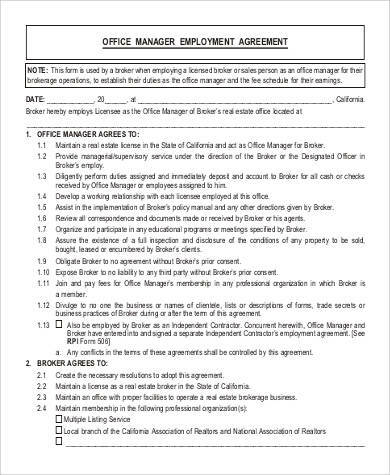 Our agreement forms, employment separation agreement forms, employment agreement forms, and executive agreement forms provide the most in-depth contracts that cover the important aspects of an agreement.